My back has been killing me all day. I was doing okay and then gave the dog his meds and something went. I could barely walk. Between Tiger and I, our house is like a sick ward, lol. Tiger had an eye procedure this week and the poor baby has been in pain so I gave him his pain meds wrapped in a piece of cheese. Then I went to take MY meds and I wrapped the pill in a piece of cheese and realized, "What am I doing? Should I also pat myself on the head and say, 'Good boy?!" Tonight DH is carving the pumpkin for tomorrow night and the legions of kids we will probably get. I have a "hot" date with a heating pad, lol. With those wonderful ladies. Stop by and leave a comment and have a chance to win an autographed copy of The Empath, my first Nocturne. In other news, I hurt my back, but I'm hoping the meds will help it heal. I also learned my May release, THE LADY AND THE LIBERTINE, has been moved up to April. I have the cover, but have to figure out how to upload. Carol Anne used to be an editor at the paper where I worked. She was colorful, outspoken, loved animals, and the environment, and wasn't afraid to state her mind. I always admired her for her gusto and passion for life. She was a writer for The Huffington Post. Click here to read the tribute. Here's the cover to BROKEN SOULS, my Nocturne Bite out Nov. 1, same release date as ENEMY LOVER. Broken Souls is another Draicon werewolf book. Does the cover look familiar?Take a look at the cover to THE EMPATH. LOL!! Same setting different head. She was forbidden by the Draicon to cast the blood-to-blood spell. But Katia was determined to find her father, and the spell was her only option. The Draicon had taken her into their pack when her own family had been destroyed by the Morphs. But Katia had never given up hope that her father was still alive, and refused to mate for life with her beloved Baylor until she found him. Now Baylor had given her an ultimatum, and Katia was forced to take drastic measures. But when Katia's spell summoned a Morph claiming to be her father, nothing Baylor said could convince her of the danger. Baylor knew too well the cost of trusting a loved one who'd turned, and desperately wanted to save Katia the pain he'd lived with for so long. He also knew that if he spared the Morph, it would destroy Katia, but if he killed this evil being, he risked losing her love forever. I always wanted to write their story,and it fit well into a Nocturne Bite. There's something funky going on with my wireless keyboard. I bought this computer about 3 years ago, and now the keyboard is going funky. I have to type on top of the desk. I don't know what the deal is. Got some good news last week which I'll be sharing soon. In the meantime, it's back to writing, since I have a new project and a new deadline. Blogging today over at Unusual Historicals on this topic. Today's Hump Day Hunk is none other than the fab. Gerard. Since Halloween is fast approaching, I'm thinking vampires in addition to weres, and Dracula 2000, a very hot movie with an even hotter vamp. For today's Hump Day Hunk, this is how I'd envisioned Damian, the hero of Enemy Lover, my November Nocturne. Not with the lion cub, though he does rescue Jamie's cat in one scene. Got some cool reviews for Enemy Lover. Yay! And a friend, whom I gave an author's copy to, loves, loves. loves it! It means a lot to me because she adored The Empath and couldn't wait for Damian's story, and liked this one better. She sighed over Damian. The books are connected, but you don't have to read The Empath before reading Enemy Lover. "Damian Marcel, Draicon of his pack, is looking for his draicara, his life mate. After she tried to kill him, it’s a wonder he would want to find her for anything but revenge but he knows she is the one who is the other half of his soul. Now he has tracked her to New Orleans and longs to make his claim. Jamie Walsh believes Damian killed her brother and fled after her attempt to kill him with a poison kiss spell led her to New Orleans. The last thing she wants is to see Damian again so she is none too pleased when he arrives at her door at the same time she is secretly thrilled. Damian and Jamie are perfect complements to one another, which made the enmity Jamie feels for Damian in the beginning so shocking. We all know they are meant for one another, as does Damian, but watching them fight the attraction provided plenty of tension. I love the bits of humor we find throughout which keep the story from becoming too dark. Jamie is a techno-geek who is addicted to gaming and Damian has been around so long he can’ even figure out something as simple as a basic cell phone. This made for some lively moments that bring you to chuckle. Add that to the usual conflicts between a very powerful Alpha male whose protective instincts are in full swing and a strong willed, stubborn and independent female and you know there is going to be more than one explosion. The sense of impending doom is quite pervasive from the first page. The Morphs are growing stronger and bolder as well as more desperate as they try to stop Damian and Jamie. Of course the ever present stone spell leaching away Jamie’s life adds intensity as well. As if that wasn’t enough, we also find some very dark stories involving Damian’s brothers and Jamie’s distant family from her childhood. I thoroughly enjoyed The Empath when I read it last year and I was intrigued by Damian’s story from the first moment I met him in the midst of the secrecy surrounding him. So I was quite excited to get his story at last in Enemy Lover and find out what really happened. In fact, I liked Enemy Lover even more than The Empath. The whole premise of Jamie’s plight was fascinating and I love the originality of the stone spell dooming her. When Jamie finally learns the truth about what really happened the day Damian killed her brother her emotions are quite powerful, especially in light of some of the other revelations about Jamie we discover. You will definitely want to pick this one up as soon as it is available. Trust me, you won’t be disappointed one bit by Enemy Lover." "The spellbinding interweaving of the supernatural, passion and emotion found throughout ENEMY LOVER bring out the innermost sentiments of the reader. With compellingly fascinating scenes and numerous appealing characters, ENEMY LOVER delivers a superb story which will touch your heart and keep you totally engrossed. Bonnie Vanak has crafted a paranormal tale with masterful storytelling, where emotions are explosively expressed and desires are never far from the surface. 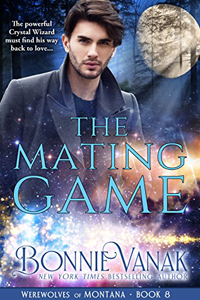 As the Alpha of a Draicon werewolf pack, Damian Marcel vows Jamie Walsh will be his one day, as he knows she is fated to be his mate even if she is human. Things did not go well for them when they met previously, as Jamie is now hiding from the man she tried to kill after she witnessed him taking part in the murder of her brother. However, Damian has tracked her to New Orleans, his childhood home, and has learned some very disturbing news about her. It seems in her quest to possess some magick of her own, a stone spell was deliberately cast upon her by an enemy of the Draicons. This dark magic will cause her to physically turn into granite, where her mind will still live eternally. Although she is drawn to the commanding werewolf, Jamie feels she can never give her trust or heart to the one responsible for killing her brother. When Damian says he will do what is needed to save her from this fatal spell, she finds herself closely working with him to find the very old Book of Magick which hopefully contains a healing cure. Unfortunately, the Morphs, former Draicons who use dark magic for self gain, also want the book for their nefarious purposes. As clues to the whereabouts of the book are discovered, Damian and Jamie begin to comprehend what destiny has in story for them. Regardless of the premise, the stories by Bonnie Vanak capture the reader’s imagination. There is always a memorable cast of characters, and the plot is constantly enthralling. For her second Nocturne book, Ms. Vanak continues with the intriguing saga behind her werewolf stories and brings it convincingly to life. The paranormal elements are smoothly blended in with what is considered normal, and every instant of the story seems entirely conceivable. 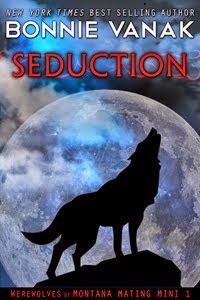 Werewolves are one of my favorite supernatural beings as I admire their loyalty and the fervor which is shown toward their mates and packs, and this trait is portrayed to its fullest by this skilled author. The determination of Damian to watch over the members of his pack plus the woman who is his mate is depicted with an unbending resolve, and the reason behind his doggedness is touchingly conveyed through several poignant scenes. As more comes to be known about this powerful werewolf leader and his destined mate, Jamie, their futures became very important to me, and the frequently heart-pounding incidents surrounding these two filled with both physical and emotional anguish made the outlook very uncertain. Now that I'm off deadline, I'm concentrating on filling the well, as Julia Cameron puts it. Reading The Artist's Way. I have the book open on my desk, my CLEAN desk, and read a little each morning before heading off to work. So what did I do this weekend to replenish my creativity and get my muse inspired? I cleaned out the linen closet. I can actually find towels now, instead of putting out an APB when guests come over to use the hot tub. I think Elvis may have been living in said closet. I also cleaned up the computer room. It feels wonderful to walk in here and see a real room! Instead of a jumbled mess. It's my space for getting away from it all, when the weather is still hot, like it is now. Also going to catch up on reading. What a luxury! Got some very nice reviews for Enemy Lover. I'll post in a separate blog entry. Fun contest over at Barbara Vey's blog! I'm there today with my dog, just match the author to the pet. Hint: I'm the blonde. The dog is the one with the smile. His name is Dolce. Go have fun and win prizes! Click here. The Broward County Humane Society has 20 dogs in need of good homes. These are dogs who were left homeless after Hurricane Ike hit Texas. Adopting a dog is so much better than buying a puppy. It means giving a dog who needs love and affection a good home, and saving their life. Last year after our beloved Tia died, we adopted a Shih Tzu. Sadly, she was older than we had realized, and died one year ago on Halloween, but for the year we had her, she had a good home. This year we took in Dolce, another refugee whose owner had to give him up. He's been joy in our lives. He greets us with a toy when we come home, likes to play, and he's just a total sweetheart. Even Tiger, our older Shih Tzu, gets along fine with him. Please consider adopting a homeless dog. Click here to see the adoptees. Hooked on Torsos lately. Is that like being hooked on phonics? This month I'm running a contest to celebrate the November release of my werewolf Nocturne, ENEMY LOVER. Pop on over to Fresh Fiction to enter, and you could win an autographed copy of my first Nocturne, The Empath, which is out of print. Click here for the Enemy Lover contest.